Designed to accept all major brands of interactive whiteboards, this system allows you to mount your interactive whiteboard in front of your existing chalk or dry erase board and slide it out of the way whenever you wish. 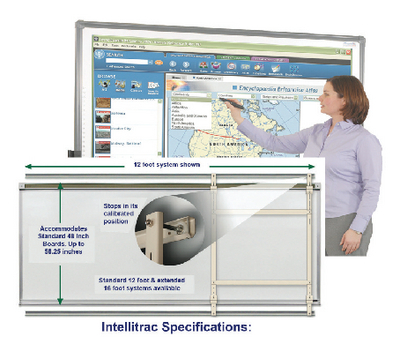 The Intellitrac utilizes a very secure and durable dual-track system with rails that attach above and below your existing board. Intellitrac accommodates standard 48" height boards up to a maximum of 58.25" with a five-position height adjustment. Manufactured of professional grade 5052 aluminum and finished in oyster white epoxy powder coat color, the system is vailable in your choice of 12' and 16' length rail system. Ships direct from the manufacturer via UPS. Must specify brand of Interactive Whiteboard used when ordering.